According to a recent report released by the NCGS, graduates of all-girls school are more academically engaged than their coeducational peers. Learn more. Congratulations to this year's National Merit Finalists! Congratulations to Team Enerjagers for winning the National Grand Prize for the Lexus Eco Challenge! Click here to read more. Our students are passionate about serving the dear neighbor. Single-gender education helps young women reach their full potential. Learn more by clicking here. Saint Joseph Academy offers a wide variety of Visual and Performing Arts Courses. Click here to learn more. Saint Joseph Academy offers 16 Varsity Sports. Saint Joseph Academy, rooted in the spirituality of the Congregation of St. Joseph, fosters unifying relationships with God and all creation, empowers each young woman to achieve academic excellence, and inspires a life of compassionate leadership and service in a global society. 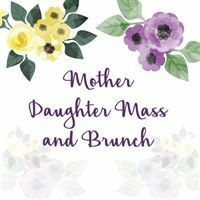 The annual Mother-Daughter Mass and Brunch will be held at the Academy on Sunday, April 28. Stop in the Paw Prints Store now through Tuesday, April 16 to take advantage of our Spring Sale! College Counseling is pleased to host their inaugural College Week leading up to the Wednesday, May 1 College Decision Day.